Exif Data: Nikon D5000; Lens: Nikkor AF-Zoom 70-300; 300 mm; ISO 400; f/5,6; 1/1000 s.
Walking in the streets of Medellin you find endless things to shoot at, nice buildings, trees, nature, birds, colorful stuffs, architecture and so on; but there is something that I’ve always loved about the city, and it’s about the buildings, the design is simple and elegant at the same time, they got so many details that not everyone appreciate. 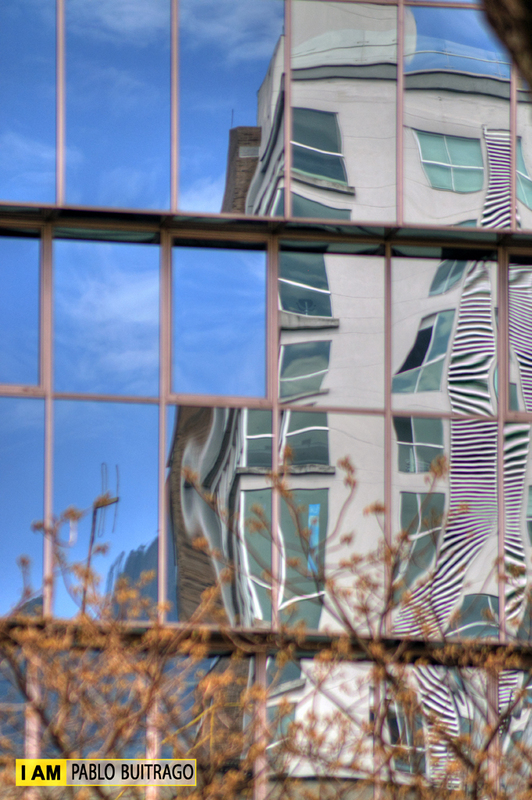 I used the reflective glass on one of them to reflect another building. To be honest, I didn’t have enough time for being out shooting photos, but I made the most of the few time that I had. Check out my last post, day 200, I added a new photo of the stone, the place where I shot the panorama from; and also in day 199 added a new photo from Medellín. En las calles de Medellín hay infinitas cosas a las que se les puede tomar fotos, edificios, árboles, naturaleza, arte, gente, entre otras; pero hay algo que siempre me ha gustado de la ciudad, y es el diseño de muchos de sus edificios, es simple pero a la vez muy elegante y lleno de detalles que no muchos llegan a ver. Para esta foto, utilicé los vidrios reflectivos de uno de ellos para reflejar otro edificio que se encontraba un poco lejos, y éste fue el resultado. Love the photo! Such an interesting idea. When on the odd occasion I find myself in the city, I often find myself bumping into people because the variety of reflections from the crystal towers are so diverting and this is a ripper. Hi Pablo, the composition is intriguing, and the colors are glorious! Ana, la próxima vez que vaya cuadramos para salir a tomar fotos! Este fue un viaje más bien inesperado y lleno de cosas para hacer, pero la próxima cuadramos con tiempito. Love the abstract look of this image. I absolutely love, love, love photos like this. great reflection and composition. This is absolutely fantastic! You did quite well in with the limited time you had! I like this one, Pablo. Reflections are cool, but this one is really cool. 🙂 You have a good eye. Me encantan los reflejos, tomar fotografias a estos me parece divertido porque los resultados, por lo menos a mi gusto sonn muy extraños y bonitos, este esta especialmente interesante!!! Love the composition, Pablo. Very nice capture! This has the quality of an abstract painting. Well captured, Pablo.